One of the biggest challenges faced by amputees who use prosthetics is getting over the feeling that their prosthetic is not part of their body. It’s partly a counter-intuitive problem: of course, the prosthetic is not part of the body, but it’s essential for the user to imagine it is if they are to get the best use from it. One particular problem is that amputees can often ‘feel’ their missing limb; or at least, a distorted version of it. Researchers at Lausanne Polytechnic University (EPFL) have experimented with sensory illusions to determine whether amputees’ nervous systems can be “tricked” into accepting the prosthetic limb. The technique relies on the axiom that “seeing is believing”. This can itself be a reason that amputees opt out of prolonged use of prosthetics, especially of artificial hands: essentially, their own perception of the missing limb – or the sensation of it – does not match up with what they can see of the prosthesis. Part of the problem is that the phantom limb often perceived by amputees is much smaller than the actual lost limb; and as the prosthetic does not provide sensory feedback, the user can only tell it is being used correctly by watching it. The mismatch between vision and sensation can be an overwhelming stumbling block. The EPFL research, published in the Journal of Neurology, Neurosurgery and Psychiatry, combines physical stimulation with virtual reality. 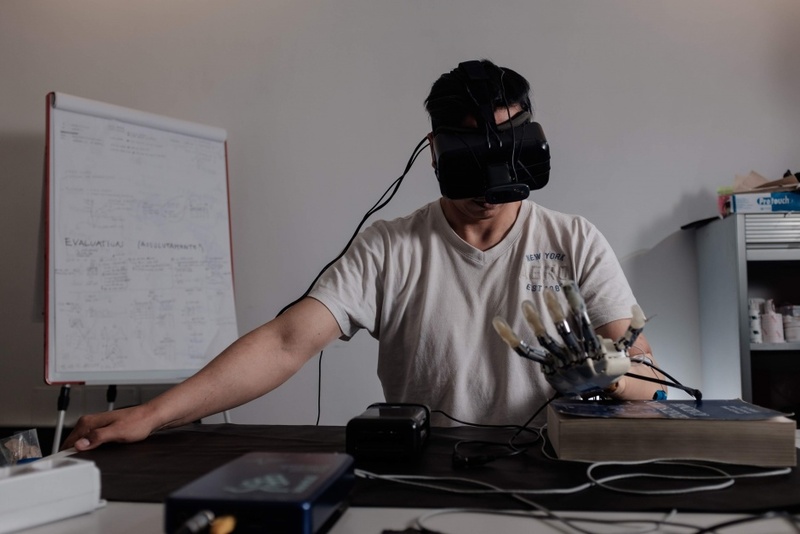 The team, from EPFL’s laboratory of cognitive neuroprosthetics in collaboration with Scuola Superiore Sant’Anna in Italy, produced an artificial tactile sensation at the tip of the index finger of the phantom limb by stimulating nerves in the remaining stump of an amputee patient, while simultaneously showing the index finger of the prosthetic limb glowing on a display in virtual reality goggles. The experiment was only carried out on two patients, however, both of them reported feeling as though the index finger sensation was occurring in a prosthetic hand that belonged to their body. Moreover, they felt as though their phantom limb had extended into the prosthetic limb. This feeling persisted for 10 minutes after the experiment. This is just amazing news, and should bring in a new wave of progress in the field of prosthetics.